Japanese Episode AG 073: "Kindan no Mori no Ouja! Fushigibana!!" American Episode 345: "Grass Hysteria"
Satoshi and his friends are lost! As the gang tries to figure out where they are, an Airm'd swoops in and grabs Haruka! Satoshi, Takeshi, and Masato try to follow, but they are stopped by a group of hooded men who forbids them from entering the forest where Haruka has been taken. It turns out that the forest is a sort of refuge for grass-type pokemon, and that humans have been forbidden from entering! Satoshi finds a way into the forest anyway, and it isn't long before he runs into Haruka and a Fushigidane she befriended along the way. As the two trainers hang out with the various grass pokemon, including the Fushigibana who leads the group, they are attacked by the Rocket-Dan. Their mecha is no match for the combined power of the paradise's grass-type pokemon, and before long the mecha is sent packing. As Satoshi and his friends prepare to leave the forest for good, the Fushigidane who Haruka had befriended jumps into the young trainer's arms, asking to be taken along. The grass-type pokemon agree to let the young pokemon go, and so a new addition is made to Haruka's team. This was an alright episode. If you can ignore the randomness of Haruka getting picked up by an Airm'd (hey, the show's writers had to separate her from the group somehow), you'll see one of the more interesting "paradise full of grass-type pokemon who are in trouble" episodes of the series. Giving Haruka a Fushigidane is a kind of lame way to promote FireRed / LeafGreen (and also starts the whole "Haruka is becoming Satoshi's clone!" argument), but I guess the pokemon suits her well enough that it doesn't bother me too much. 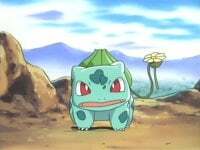 It was also great to see Fushigibana again, since we haven't seen it since... "Bulbasaur's Mysterious Garden," back in Kanto? It's been a while. PokeAni speculates that the Rocket-Dan's mecha (the Ofukuro-san, in the Japanese version) is a combination of the mother from ATASHIn'CHI and the mother from Kasumin, so I guess that's where that particular mecha comes from. The dubbed version is almost completely edit-free. There are fewer time cuts than usual, which seems really odd to me. Another odd thing is that they showed the Rocket-Dan's mecha do the bii-da thing when they removed the same thing from the previous episode. 4Kids can be really difficult to read sometimes. Can you believe that the first time cut of the episode doesn't occur until after the Trainer's Choice commercial break? That's certainly a rarity. Anyway, you know the shots of Team Rocket's mecha scooping up pokemon and Ash's and May's reaction shots right before Jessie and James perform their motto? In the Japanese version, the show's commercial break takes place at this time, and after that those last five seconds are replayed. 4Kids cut out this repeated footage for the dub, since their commerical break took place earlier in the episode.. The shot right after Kids' WB! 's final commercial break is cut. And...there's no TO BE CONTINUED... time cut!